Using open source tools ( python / openGL / … ), our research group is working to create an intuitive, interactive 3D knowledge visualization system that explores a more organic approach to knowledge and data visualization. The hope is by borrowing from our interests in alternative user interface design, AI and aLife systems, visual and interaction design as well as intelligent systems that we can create a more living and intuitive system for exploring date spaces. KnowViz’s 3D navigation of James Burke’s open knowledge effort: k-web.org. Here each spiral shows 100 years of the birth of scientists, thinkers and artists represented as dots in their category color. 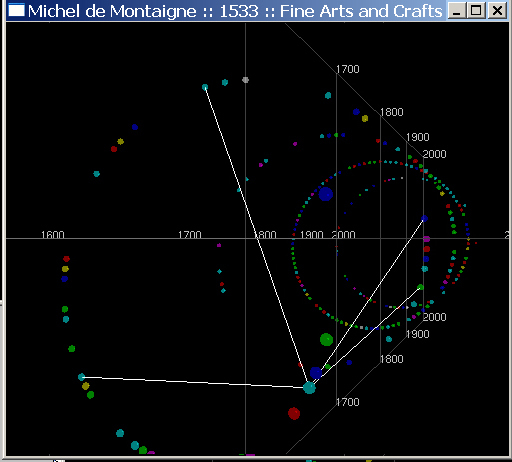 We have picked Michel de Montaigne, which brings up his extensive XML page (not shown) and graphically shows his links to associated people in the database. While our prototype is still in an early stage we have begun working with the K-Web Project. Brain-child of BBC “Connections” series author and host James Burke, the Knowledge Web (k-web) not only informs about the scientists, artists, innovators and explorers of history but also the connections between them. Users not only learn about history’s movers and shakers in their own context but also how they impact modern life. We are interested in alternative ways users can interact with the k-web knowledge base. The last image represent a new research effort to create a Multi-User 3D K-web Game called K-Worlds by the SFU 4th year class, Immersive Environments. See the SFU/FIT Collaborative Design Project in the iVizLab research section for information on last years Immersive Environments project.